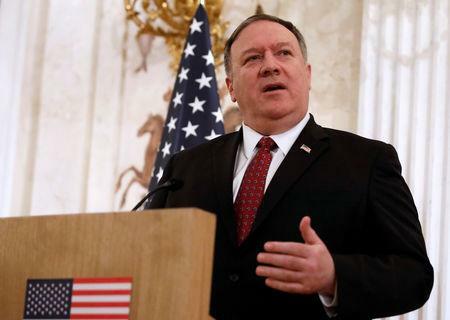 (Reuters) - U.S. Secretary of State Mike Pompeo said on Wednesday a woman born in the United States who joined the Islamic State militant group did not qualify for U.S. citizenship and had no legal basis to return to the country. Hoda Muthana, 24, traveled to Syria over four years ago to join Islamic State, also known as ISIS. She married a succession of Islamic State fighters and went on Twitter to encourage attacks on the West. In media interviews this week from a detention camp in Syria, Muthana said she was sorry for her actions and wanted to return to her family in Alabama with her toddler son. Pompeo said Muthana was not a U.S. citizen and would not be admitted into the United States. "She does not have any legal basis, no valid U.S. passport, no right to a passport, nor any visa to travel to the United States," Pompeo said in a statement. President Donald Trump said on Twitter he had directed Pompeo "not to allow Hoda Muthana back into the Country!" Pompeo’s statement did not explain why the State Department did not consider Muthana a U.S. citizen. The action followed Britain's move to revoke the citizenship of a teenager after she joined Islamic State, citing security concerns. Muthana’s father was a Yemeni diplomat, working in the United States. Children born in the United States to accredited diplomats, under the 14th Amendment, do not acquire citizenship since they are not "born ... subject to the jurisdiction of the United States," according to United States Citizenship and Immigration Services. Hassan Shibly, a representative for the Muthana family and a staff member of the Council on American-Islamic Relations, tweeted that she was born in Hackensack, New Jersey, in October 1994, months after her father informed the U.S. government he was no longer a diplomat. Charles Swift, director of the Constitutional Law Center for Muslims in America, said her father's revocation of his diplomatic status meant Hoda Muthana was a U.S. citizen. Swift said he planned to file a lawsuit over her case.